← Advent: Are we ready? Light up a Life services with the Norfolk Hospice, Tapping House are being held this week. 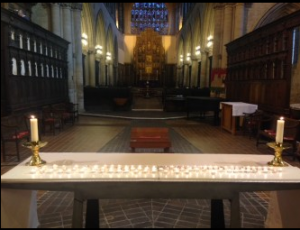 Over a hundred people joined us on Sunday 4th December, at King’s Lynn Minster and lit candles which were placed on the altar. Carols were sung and people had chance to reflect and join together over a cup of tea and a mince pie. On Monday December 5th, a service was held at the Sandringham Visitor’s Centre and more than a hundred people listened, prayed and lit candles too. Tea and mince pies again on offer and a well needed chance to meet and chat! This entry was posted in community, Faith goes walkabout and tagged Hospice, Light Up a Life, prayer, Sandringham Visitor Centre, Tapping House. Bookmark the permalink.